ikat bag: And what of the new year? This is the time of the year when I look back and wonder where the time went, and what I actually accomplished, and whether next year I'm going to sew exactly the same kinds of bags and dresses as I did this year. And also whether I'm going to do the same old on the blog as I did in 2011, and the year before that, and the year before that. Yes, friends: once again, 'tis the winter of my discontent. Some people have sewing blogs. They're focused and they're singularly productive in turning out garments and bags and toys and curtains and bedlinen. Some people have quilting blogs, and they design block after block of gorgeous color and ingenious matches. Some people have crafting blogs and they make stuff I can't stop pinning. Some people cook and bake and I gain pounds just looking at their photos. Yum. And some people are a bit all over the place. They sew a bit and get bored. They make cardboard toys and get bored. They draw silly cartoons and get bored. Secretly they actually just want to go swimming, which is never boring. Aaaaaaaaaaaaaaaaaaah. That would be me. This coming year, I need to be challenged -again- because, honestly, I'm bored. I already said that last year, so even saying it now is boring. In 2011, I managed to fill the days with all manner of odd things to make, and dug out some ancient unfinished projects and actually finished them, by gum! Throughout the year, I'd been fighting the sense that all I was doing was playing catch-up with old projects. I told myself stuff like, "if you don't finish those dolls, or those bibs (ha ha ha ha ha! My eldest, for whom I cut them out, is now seven, for heaven's sake) or alter those pants, you have no right to start that new ambitious project." So I finished them. Like squeezing blood from stone, I finished them. And now, as I don't think I have any more outstanding incomplete projects, I might just be able to peek around the corner into 2012 and start planning my crafting year on a fresh slate. Which brings me to creativity. What should I make? Or, more helpfully, in which medium should I make it? Fabric? Cardboard? Pen-and-ink? Electronics? Yarn? Dried squid skin and thumb tacks? Fabric is more stylish, of course, and sells better (than cardboard, and certainly squid skin), and is easier to buy in different varieties. 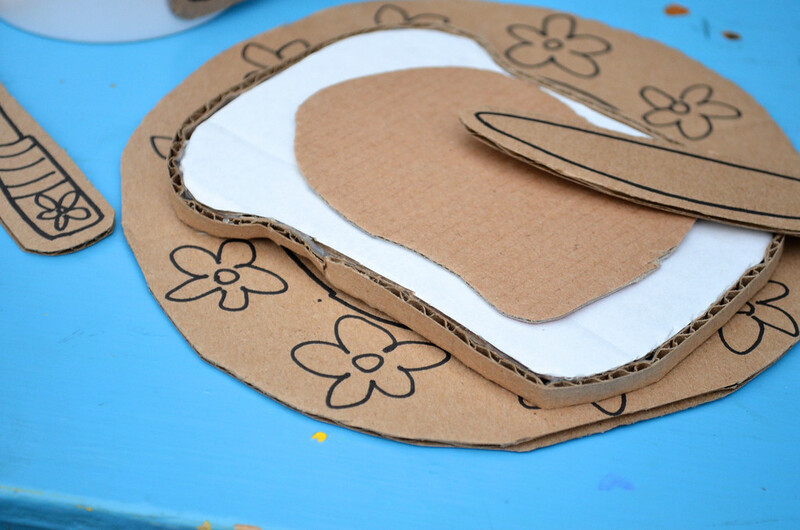 I've made some wacky things on my sewing machine in the distant past but they are nothing compared to the cardboard ideas I have to beat down every day just so I can put dinner on the table at a decent time. I still want to make that full-size rocking horse from cardboard some day, for instance. Even the kids think I'm nuts, and who can blame them? "It's not strong enough to sit on!" they feebly counter. Oh yes it is, my sweet children - you don't esteem cardboard quite highly enough. At least not as well as you will by the time you have kids of your own. We've only been scratching the (corrugated) surface all this time. When I first thought about it, I postulated that all this listlessness stemmed from my having been sewing for just too many years. It's that horrible proverbial plateau everyone dreads will happen to them, an attenuation of sorts (to borrow a Physics term). This may sound silly, but there are times when I get comments from people who have just started -or resumed sewing after a long hiatus - and I envy their enthusiasm and excitement. My husband, who listens to my craft complaints, reads my blogs and solves my computer and camera problems, thinks I should try a new craft field. Like fine art. Or pickling. Or anything, really, that doesn't involve gigantic cardboard boxes to infest the basement. Interestingly, we also ruled out knitting/crochet (gigantic skeins of yarn), soap making (gigantic tubs of lye), pottery (gigantic kiln) and upholstering (gigantic industrial sewing machine). Not a bad idea in itself, taking up a new craft, but - here's the irony - I've been playing with cardboard even longer than I've been sewing, and I'm not bored with it. So what gives? I often think that there is a limit to creativity in fabric that is absent in cardboard. I mean, we're all still in very safe waters where sewing is concerned- same bags, same dresses, same pants, some dolls, same patterns, same vintage remakes. New designer prints to quicken the pulse a bit, yes, but we're still bouncing off one another's safe, cute, easy ideas, aren't we? And no, it does not count to take gorgeouser and gorgeouser photos of the same bags, dresses, pants, dolls, patterns and vintage remakes. My new year wish for the crafty/sewing blogging community is this: let's raise the ceiling this year. Remember Jodie's Selvedge Frock? I remember how good it felt for my jaw to hit the floor when I saw it. Bless her. I've seen nothing close to that ingenuity in sewing blogland since, frankly. Please don't misunderstand, friends- I've seen amazing and clever and beautiful things on blogs and in books this year and have had many of those "why didn't I think of that?" moments. And I've even made a couple things from other people's ideas because they were so much fun. But I'm not talking about a new little novel project that I'd pin or bookmark - I mean, when I saw Jodie's frock, it never crossed my mind to try and make my own selvedge frock, or selvedge zippered pouch or zippered crayon roll or whatever. Its jaw-hit-the-floor-ness was entirely based on its making me sit up, and wanting to try something new and different with my own craft simply because someone else pushed the limits of her field a little farther out of reach, and made it all the more enticing for it. It's easy with cardboard, but I want to do that with fabric, too. Push the limits, I mean. Just as I've done by moving to and living in the US these past years, I almost feel as if I need to move to another country for a while and immerse myself in their fabric and sewing culture. I'd love to be able to sew the clothes that are popular there, or study the way they manipulate fabric into garments and other products. I don't mean buying a couple of sewing magazines from, say, Japan, because I already have magazines like those and I haven't felt inspired to sew Japanese frocks. 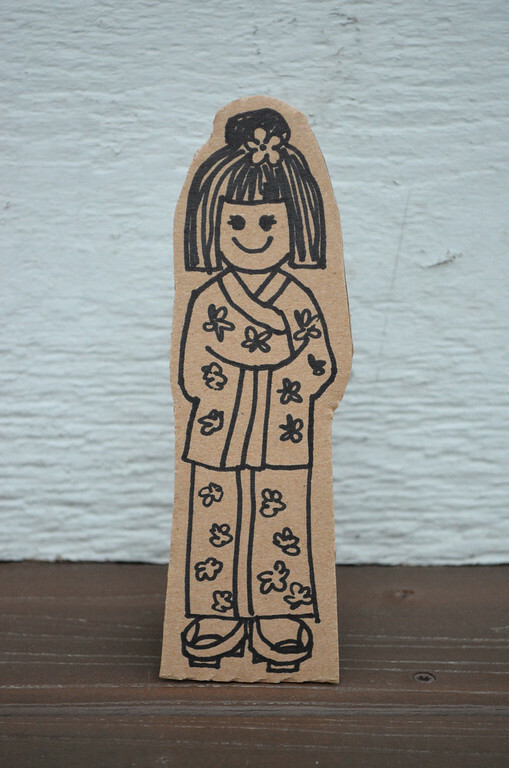 Wait- unless it's a kimono, I mean. A real kimono. You think? A couple of months ago, I was at the birthday party of one of Jenna's classmates. His mom is Vietnamese and she had a sewing machine and a serger in her house. We talked a bit about sewing - she sewed clothes professionally when she first came to the US, but doesn't now. I also found out that, like me (and practically all of Asia, really), she doesn't use patterns and can't understand them, so she drafts from people's measurements, too. "It's how we were taught." We said to each other, sadly, as if it were some kind of genetic defect. He he he. So what is it like to sew in Italy? In Africa? In Russia? In Korea? In Mexico? People leave comments all the time, saying they covet the fabric we have in the US. Well, I covet your sewing culture, wherever you are. It's different and new and fabulous and you have so much to teach me. K: Mum, can you make a Barbie castle? K: A Barbie castle! You know! Me: How do you make that? K: You take cardboard and tape and you make it! Pleeeeeeease? Wight now? So that's where we are this year-end. Thought I'd just share. Sorry for getting all introspective on you all. I have projects planned out, of course, for 2012, that have nothing at all to do with the sentiment in this post but they're just projects. They're not the essence -or the embodiment- of creativity by any stretch of the imagination. And the last thing I want is to fill my year with more of those Just Projects. So come on in, 2012 - and bring something awesome with (as they say in Minnesota)! And you, lovely readers, tell me what you're planning for your new year! Well, Grandma G, I have some boring ol' sewing projects lined up, too! Comfort sewing, I call it. Today, for instance, I sewed four baby taggie balls. Um, same old. See what I mean? I don't know what I'm making in the new year; but I do know that I, too, envy other's sewing cultures. One friend was from Honduras and was raised sewing without patterns. They'd take measurements, do a little draping, and drafting and voila--they'd make a dress, copied from a picture. WOW! I'd love to have the courage to do that. Which, actually is what I have in the back of my mind to do; just need to move it to the front of my mind. 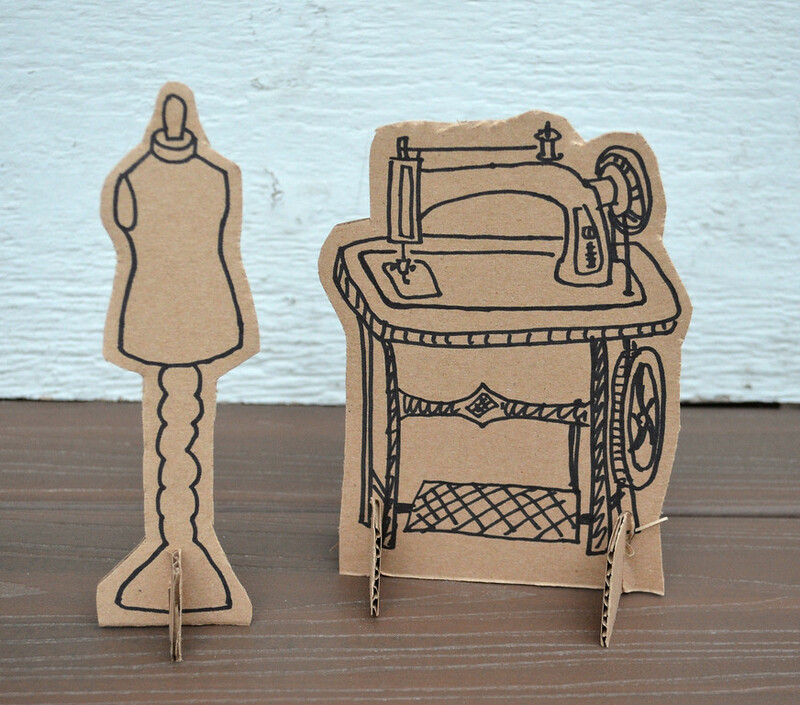 Your cardboard creations are jaw-dropping to me. I wish I'd seen them when I had little children. We moved every few years and had great boxes. Maybe for the grandchildren. LiEr-you are so good at putting it into words. I am all over the place and have so many interests and ideas, I do not know where to begin. I have several projects to finish, several to give up on and a few new ones-reusable lunch bags and produce bags, for one. Cook, sew, write, read, garden, play they are all better than cleaning and filing. I love the uniqueness of your cardboard designs especially the latest where you have incorporated lights! There is always something new out there in arts and crafts world and I am sure that you will be successful at whatever you choose to do. Thanks for sharing your amazing ideas even if they may seem boring to you; not so to those of us who enjoy reading your blog! For what it's worth, I don't think of yours as a sewing blog. I put you firmly in the tinker/learning/inspiration category. I can look anywhere for sewing. But cardboard? I come here for cardboard and real learning. Pretty pictures I can find all over Pinterest. But posts that make me wrinkle my brow and think "What the heck is she going to do with that?" I come here for those. I think I can safely quote any given princess when I say "Follow your heart." Well I don't have any answers for you but I'm hoping you have a great new year & find the creative inspiration you are looking for! P.S. Is Kate's barbie castle done yet? I know EXACTLY what you mean, and your example of Jodie's Selvedge Frock is perfect. I can't even think of more to add, because you said it so well! I don't do boring sewing. I can't make myself do it. Whatever I make is different and I always change it as I go. MY attention span is just too short. I don't know what I am going to do in the new year so I (as a kindred spirit) strongly suggest sticking with what is not boring. I Love your Physics and cardboard posts. Right now I am visualizing that Barbie castle made from cardboard covered completely with fabulous fabric. Oh, wow! Dear lady, you are not only a creative genius with fabric, electronics, cardboard, birthday party favors and games, AND sqid skin, (beyond anything I could imagine, much less do), but you are an amzing communicator. I love all of your fantastic creations, but I also love your writing. There isn't another blog I read all the way through. Not much help here, I know. The way your incredible mind works though, I know tomorrow or Tuesday you will wake up and say, "A ha!" I can't wait to see the cardboard projects! it was funny to read that you and your husband had ruled out different crafts. My husband keeps telling me to focus on one!! I just can't stick to one thing, but we do have rulled out knitting! And my son also, now thinks I can just make him whatever he wants, only he wants it right then! :) he needs a pirate ship and I was trying to figure it out in fabric, but maybe it needs to be cardboard... hmmmm.... Happy New Year! Love your post! 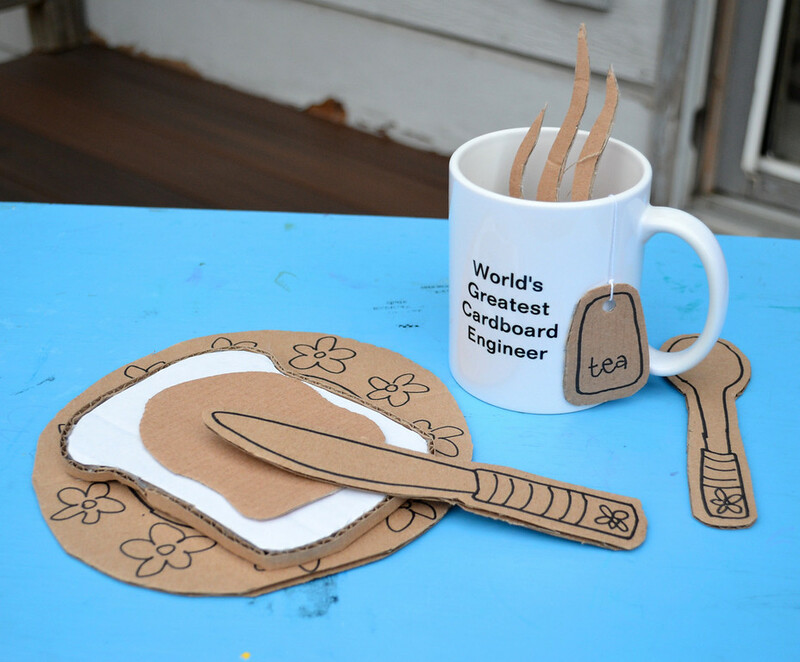 Your cardboard creations are a hoot! Next week i am helping at the school in reorganizing the art room and painting walls and cupboards, I have a doll to make and 3 birthday gifts to make. Still organizing my charity makes list for this year. I have 2 chairs to decorate and now a request from my niece for another chair so that makes 3. I simply Have to make time to reorganize my sewing space very soon too! as for what else, Plenty of ideas to carry me though the rest of the year. Happy New Year, Just keep doing what you do, You are great. I want to see the rocking horse!! I also introduced my husband to you with your lighting series as he can't wait to do techy stuff with our 6 year old son. Ah, THIS is what I come here for! Posts like this one, where we get to hear thoughts straight out of your brain. And posts where we get to hear all the hilarity that comes from the same place! It's for the READING! So, how about a book? ;o) Ha ha, whatever you decide to do, it will be brilliant to read about. well, you could write a book on cardboard, except that might be soul crushing. I am thinking of joining illustration friday, if it still exists, because I would like to draw more this year. I also enjoyed reading tinkerlab's new years post on creativity which you might enjoy. Sorry, I meant Illustration Friday, not Sketch Friday or whatever it was I said. and thought of you and your post. Thank you for all your hard work and inspiration. Happy New Year! My next project is a quilt for my son. Just finished handquilting one for the living room. As a mother of boys I love coming to this blog for the truly boyish (ironically I was one of three girls growing up - like your daughters!). One of the grossest (to me) but most exciting things for my oldest son was when we disected the pet salamander that we couldn't keep alive (oops). Obviously you already have some experience with Zoology (someday Pig, someday), but maybe other sciences are as yet untapped? Good luck wonderful, creative, inspiring lady!